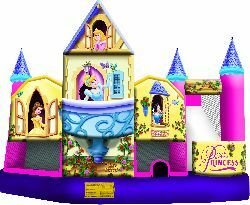 This Disney princess 5-N-1 combo jumper is sure to delight all of your of your little princes and princesses and thrill them for the duration of your event. Made from high quality lead free fire retardant vinyl, it measures 20′ long x 19′ wide x 17′ high. It includes a dedicated bounce area, slide, popup obstacle course and basketball hoop all inside of a castle! Its great for children 40″-72″ tall. Rent yours today for just $194! Please add a generator ($45) if your event is in a park.